Genetic testing indicates that our Beattys were originally one of the Border reiver families from the River Esk area on the Scottish Border, moving to Northern Ireland very likely during the Plantation of Ulster in the 17th century. Our earliest ancestor that can be identified with confidence is James Beatty (1797-1873), who farmed on Aghavoory townland just south of Fivemiletown, Co. Fermanagh from at least 1829 until his death (1,2). There were no Beattys at Aghavoory before he arrived, so his father Archibald Beatty (3), also a Farmer, lived elsewhere. The most likely candidate is Archibald Beatty (1758-1831) of Farnamullan, but this is still unproven. Aghavoory was part of the Colebrooke Estate of the Brooke family. 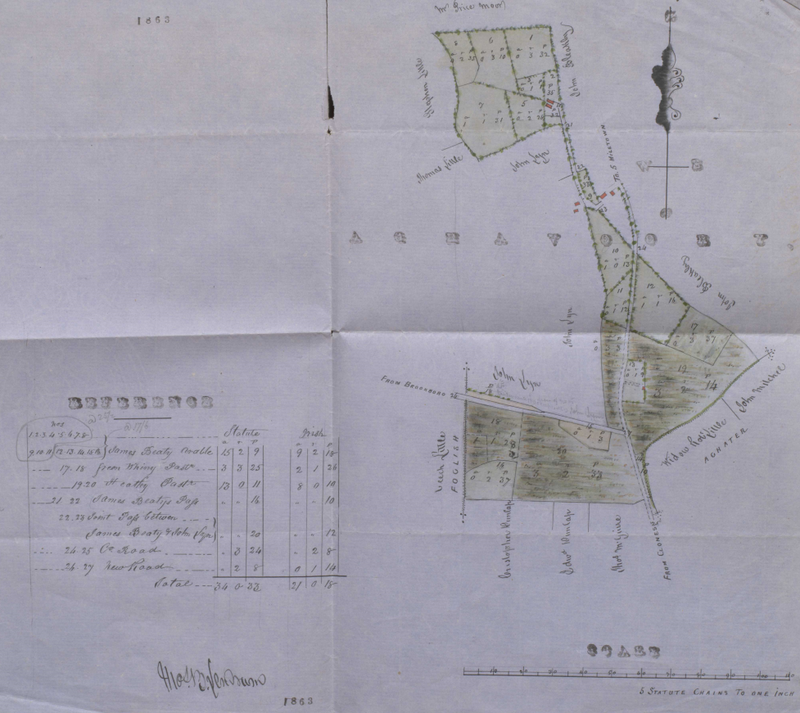 James Beatty was evidently a fairly well-off tenant farmer as I was told that he built the 19th century house on his farm at Aghavoory as well as one on his land at neighbouring Agheeter townland. 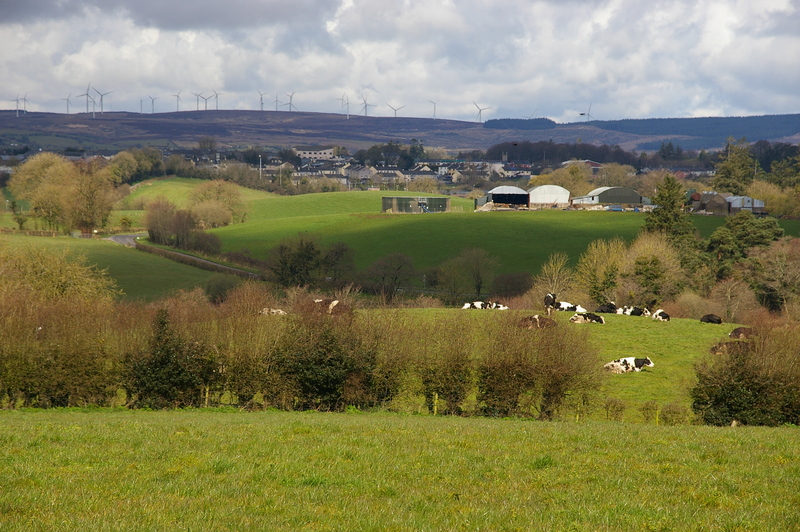 James Beatty’s house at Aghavoory was demolished in the 1990s, but it, like the current farmhouse, was on a hilltop and had pleasant views over Fivemiletown and the surrounding countryside. Very likely the farm included crops, and the maps show that an orchard was established there during James’s time, but the main business of the farm then, as now, was probably cattle. 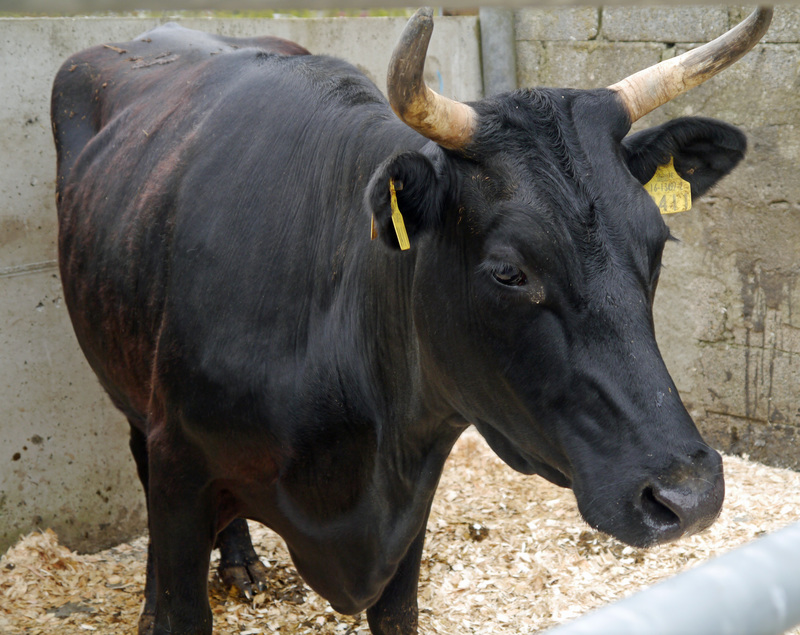 Newspapers of the time refer refer to sales of “Black cattle”, probably the same thing as “Kerry cows“. James Beatty had at least five children (4) with his first wife, our ggg grandmother, name still unknown, who died before 1858. In about 1855 James evidently gave part of his land at Agheeter townland to Joseph (5), his eldest son, who married that year (4). 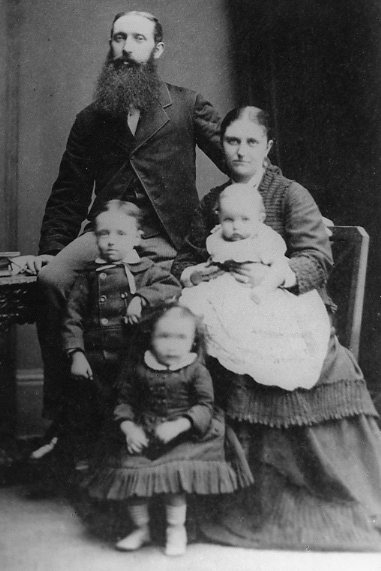 Joseph Beatty had at least eight children. His eldest daughter Sarah Beatty (1860-1951) is still talked about in the district because at age 14, she “stole a fiver” from her father to take herself to America where she in turn had a large family (6). Joseph’s two eldest sons inherited his land, one of them, also Joseph, was involved in exporting milk and eggs to England (6). Neither of the two married. (6) James of Aghavoory’s eldest daughter Matilda, married William Robinson (4) who had a farm at Breandrum, near Brookeborough but apparently they had no children. It’s possible that James told his younger sons to make their own way in the world. Anyway, they certainly did. His son Archibald Beatty (c1836-1897) was particularly enterprising. He had a Grocery shop in nearby Lisnaskea and married Eudora Tucker, the daughter of a Belfast Merchant in 1858. By 1860 he had taken his young family 90 miles across Ireland to Ballina, Co Mayo where he set up as a Grocer and Auctioneer. When Archibald left Ballina for Liverpool in 1874 after 15 years there, he received a presentation from the Protestant Young Men’s Christian Society of Ballina as “a good citizen and enterprising trader who will be missed from the town” In Liverpool he was a Provision Merchant, later joined in business by his son, Edward John Beatty, who married his first cousin Martha Eleanor, a daughter of Joseph Beatty of Agheeter (4). Archibald retained his connection with his birthplace, building a pork factory at Enniskillen and was eventually buried at Fivemiletown. His death was considered worthy of a write-up in the Fermanagh Times. Eudora Beatty of Liverpool, widow, died at Braindrum (Breandrum), Brookeborough, Fermanagh (where her sister-in-law Matilda Robinson lived) 19 Nov 1900. Probate to Edward John Beatty. After the death of his first wife, and aged about 62, James Beatty of Aghavoory married Sarah Cooke in 1859 (3). They had two daughters, Margaret and Eliza Anne. After James’s death in 1873 his wife and daughters evidently stayed on at Aghavoory, since Eliza Anne still lived there when she married Samuel Hall in 1886 (4). Their descendants are still farming there today. Our gg grandfather, also James Beatty (1842-1903), presumably also born at Aghavoory, was apparently the baby of James senior’s first family. He was only about 16 when his father remarried, and, by 1862, aged 20, had followed his enterprising older brother Archibald Beatty to Ballina, Mayo where it appears he lived at No. 5 Arran Street with Archibald and his family. Postcard of Arran Street, Ballina, Co. Mayo, Ireland, early 20th century. Thanks to Mayo County Library. There was a Draper in Fivemiletown at the time, but it’s more likely that James served his apprenticeship in Ballina, where, by 1870 he was a Master Tailor with a Drapery business of his own in Knox street. 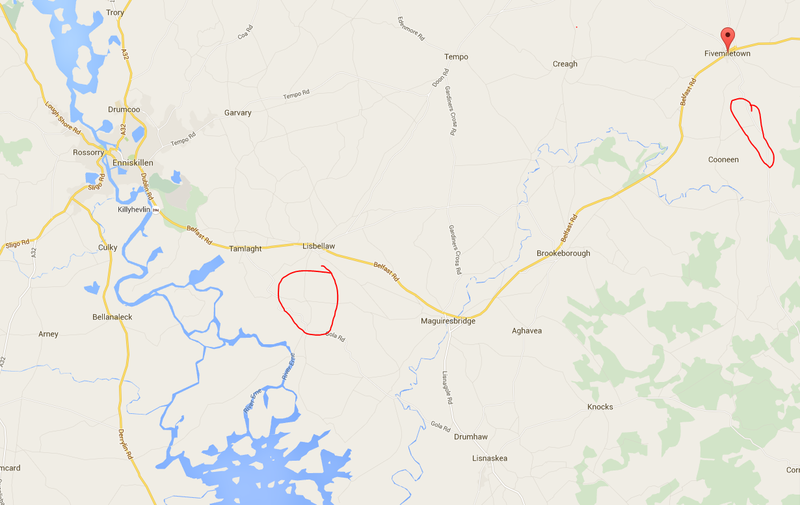 Ballina, Mayo is only about 8 miles from Enniscrone, Co. Sligo, the home of James’s future wife. 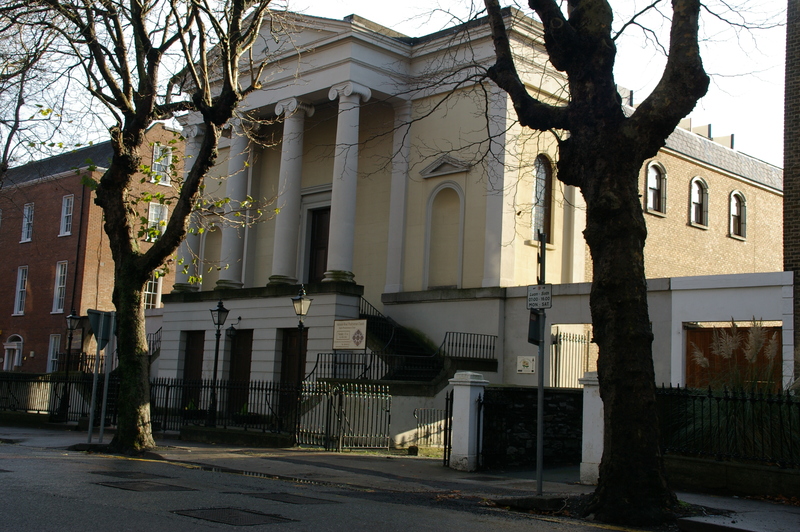 Presbyterian Church in Dublin where James and Marcella Beatty were married in 1873. In 1873, only about 6 months before the death of his father back in Fermanagh, James Beatty married Marcella Paget at the Adelaide Road Presbyterian Church in Dublin. A witness at the wedding was Marcella’s younger sister Elizabeth Paget (4). At only about 20, Marcella was 10 years younger than her husband. Her father James Paget (who had died in 1872 aged 69) is described on their marriage certificate as a “Gentleman”. This probably accounts for generations of Beattys since then having “Paget” included as one of their forenames! Her mother was Hannah Dempsey. Although they lived together, James and Hannah were almost certainly unmarried. While they appear to have spent a lot of time in Dublin, James Paget’s estate was Kinard Lodge, one mile from Enniscrone (or Inishcrone), County Sligo. Much more about James and Hannah, and Kinard is in the previous chapter, “The forgotten Pagets of County Mayo“. James and Emma, the two eldest children of James and Marcella, were born at Commercial House, Arran street Ballina in 1874 and 5. In late 1876, James arranged for one William Lennox to manage his drapery business but by February 1877 James was declared bankrupt and the business was sold. James and Marcella and family moved to Kinard Lodge, Enniscrone, to live with Marcella’s mother. Their third child, Archibald was born there in May 1877. Kinard Lodge had been sold in June 1874,to John Paget Bourke,a second cousin of Marcella’s father though the family continued to live there, presumably while planning their future. In 1876 the eldest Paget boy, Marcella’s brother James Reginald aged 23 left for Australia. He must have sent back good reports of Victoria, because practically his whole family followed him: his mother Hannah, his younger brother Charles Thomas Staveley Paget, James Beatty and Marcella and their 3 children. Baby Archie is said to have learned to walk on the ship on the way out. Some time before September 1878 they arrived in Melbourne. Sadly, after presumably being pregnant during the voyage, Marcella had a baby, David in September 1878, who died in Emerald Hill (South Melbourne) aged only 3 months. James bought a plot in the Presbyterian section at St. Kilda General Cemetery where David, and later Rupert Stanley who died aged 2 in 1892, James himself and Marcella were eventually buried. Hannah Paget and her son Charles went to join James Reginald Paget at Baddaginnie and Violet Town (near Benalla) where the two boys later married two sisters from the Beggs family. Another Beatty child who died young, Marcella Constance Isobel, evidently died on a visit to her grandmother and uncles at Woolpress Farm Baddaginnie in January 1882 , and is buried at Benalla cemetery. By December 1881, the Beattys were living at 49 Caroline street, South Yarra, at a home they called Kinard Lodge, where they lived for many years. James worked as a Commercial traveller for flour mills. The house in Caroline street has gone now, but there are several stories about life there. In June 1883, Marcella was “violently assaulted” by her servant with an umbrella. The newspaper report in The Argus via TROVE is entertaining reading, and it’s great that a few such spirited words of hers are on the record. Charles Gordon remembered as a little boy being driven home to Caroline street by his father in the gig(?) with James’s big red beard wagging as he sang cheerily. All the Beattys sang, and both Archie and Charles Gordon were members of the choir of Christ Church South Yarra for many years. Far from saintly though, the Beatty boys would get into altercations with boys from Richmond at the boundary between their territories, the new Punt Road bridge over the Yarra, built 1894. Jim the eldest, being a very large boy would sit on one of the opponents while his three younger brothers engaged the others in fisticuffs. The youngest boys, Alf and Charles Gordon were the biggest rascals. One of their sisters had a special birthday party and her little brothers hid under the long table cloth from where they could help themselves liberally to the party spread without detection. The family lived around the corner from Christ Church, South Yarra and the boys attended the Christ Church Grammar School. The Bishop was a friend of the family. On one visit to the Beattys he went to the toilet which was outdoors of course, with an opening at the back where the can could be changed. Behind the toilet, the naughty boys set fire to some paper or something, reached in and burned the bishop’s bottom! On another occasion Alf managed to set fire to Caroline street. When you went to the bathroom there after dark you needed to walk along the verandah carrying a candle. Alf was left handed and while walking along, managed to set fire to some blinds or curtains he passed. We are unclear whether or not the house survived this misadventure. We know less about the girls except that Kathleen the younger girl was considered a beauty and her older sister Emma was a very big girl. In about 1892 Archie started work with Sargood, Butler, Nichol and Ewen in Bourke St. He must have been only about 15 at the time. He rose to be a Junior Salesman in the Millinery and Underclothing Dept. In Sept 1898, at about 21, he left with a very good reference “being willing, industrious & attentive to his duties” and leaving “with a view of bettering his position”. Archie was naturally good at sport. We have cricket medallions and trophies dating from 1897. Later he took to tennis and golf, and extended his trophy collection. Have just caught up with your email of last year. Did I reply to your query about Beatty at Sligo/Mayo? Are you a member of the Yahoo GenMatch DNA group? What is your Beatty Lineage at the BP2000 Project on Roorsweb? Have you seen our latest YSEQ test breakthrough to Haplogroup R1b-A430? Please make contact at pdbeattie@lineone.net. Yes I think you did reply to my query and I think you couldn’t fit my ancestors into your family tree, but I can’t find the email now. So much for my filing system! In any case, I’m pretty sure now that my family came to Ballina from Co. Fermanagh (maybe from around Lisnaskea?) sometime between 1842 and 1870, but most likely in the window between the Griffith valuations of Co. Mayo (1856-57) and of Fermanagh (1862). We are lineage 560 and I’ve recently updated our DNA testing to 67 markers. Our haplogroup is R1b1a2. Yes I am a member of the Yahoo GenMatch DNA group and if I can break through my brick wall will gladly share the information there. The Sarah Beatty you refer to being the eldest daughter of Joseph Beatty is likely my great grandmother. Stories I’ve been told do indeed tell that being the oldest of Joseph’s nine children she stole money from him after the death of her mother (Margaret Mulligan Beatty). Sarah was expected to take care of her eight younger siblings and take on the roll of the mother while her allegedly drunken father worked the farm. In 1880 (she would have been about 20 years old) came to the United States and then to Hamilton, Ontario, Canada where she married Thomas Andrew Freeborn about 1882. They had nine children one of which was Joseph Reardon Freeborn (my paternal grandfather). I have a large photo of this family taken about 1910. Great to hear from you Kim! It certainly sounds as though we’re both descended from James Beatty of Aghavoory (1797-1873). Family stories often get exaggerated – as I’ve found in other branches of the family. You can imagine Sarah getting younger with every retelling! The interesting thing is the story is still told in her home district after 137 years!